Ford Motor Co. in Dearborn today announced it has acquired Spin, a dockless electric scooter sharing company based in San Francisco. Spin is a micro-mobility service provider with operations in 13 cities and campuses across the U.S. Terms of the deal were not disclosed. As part of the announcement, the automaker, through Ford X, a division within Ford Smart Mobility that aims to quickly build, acquire, and pilot new transportation products and services, Spin will offer 400 of its dockless scooters in Detroit starting today. The service will expand to 100 cities over the next 18 months. Spin is committed to working hand-in-hand with cities and universities to implement micro-mobility solutions responsibly, safely, and sustainably as they expand their operations. They do not launch without permission; they share usage data with cities; and they work with local officials and university campuses to design educational tools around parking and riding rules. The number of mobility options available to people has risen dramatically in recent years. In some situations, people use multiple forms of transportation during a single trip. The fast-paced, often-experimental mobility sector requires businesses to keep up with agile and adaptable customers. Earlier this year, Ford X started a micro-mobility academic research project with Purdue University that launched Jelly scooters. The research and development behind Jelly is helping Ford X better understand what’s required to succeed in the micro-mobility space, such as the importance of human-centered design, the critical importance of a reliable supply chain, and the need to work with cities and campuses to do scooter sharing responsibly. By 2021, Ford plans to launch a fleet of self-driving vehicles, most likely Ford Transit vans, that will provide delivery services in urban settings. Once a product is ordered online, the product is placed in a secure locker inside the vehicle, and the buyer is alerted when the vehicle will arrive, say near an office building. Using a code, the buyer unlocks their locker inside the van to retrieve the item they ordered. Another component of Ford’s mobility strategy is to develop a comprehensive set of software and services designed to better enable vehicle connectivity and utilization, as well as new mobility experiences and multimodal transportation solutions. Spin adds a new offering to Ford’s mobility portfolio to help people get to places more easily, more quickly, and less expensively. Using a Spin electric scooter costs $1 to rent and 15 cents per minute. 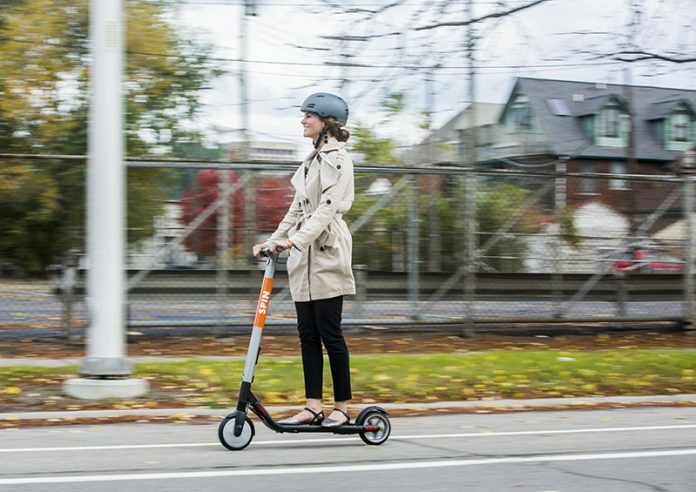 Affordability, combined with ease of use and electrified power, also means scooters can help tackle challenges such as traffic congestion, parking availability, and pollution. This presents a significant opportunity as research shows nearly half of all trips made in the U.S. are 3 miles or less, according to “The Micro-Mobility Revolution,” a report by Populus.